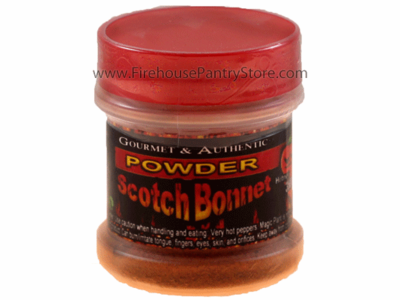 Don't be fooled by the girly name - Scotch Bonnet peppers pack a serious punch. They are very similar in spiciness and flavor to their close relative, the habanero. Makes a great addition to Caribbean dishes and jerk foods. Dehydrated, ground chilies. You really can get crispy wings without a deep fryer. We've spiced things up with jerk seasonings and Scotch Bonnet peppers! ~ Bring a large pot of salted water to a rolling boil. Drop in chicken and boil for 8 minutes. ~ In the meantime, combine jerk seasoning and Scotch Bonnet pepper in a bowl; set aside. ~ Remove chicken from water and place on a cooling rack to drain, then pat dry with paper towels. ~ Brush wings with soy sauce and then sprinkle with jerk seasoning blend. ~ Grease a cookie sheet and place the chicken in a single layer on the pan. ~ Bake in a 450 degree oven for 25-30 minutes (depending on size of your wings), turn once, and then bake an additional 5 minutes.